SANTA MONICA, California -- "Meanwhile, Back At Café Du Monde," a unique new festive series of food monologues presented by celebrities, personalities and special guests will be staged at the Sonoma Wine Garden Restaurant, 395 Santa Monica Place, Santa Monica on Sunday, Feb. 20. Dinner at 6 p.m., showtime at 7 p.m. Created, directed and produced by Peggy Sweeney-McDonald and Jay Basist of Superstar Events-L.A., the show's fun-filled monologues explaining how our lives revolve around food experiences will be presented by special guests Lynne Curtin of “Real Housewives of Orange County,” KABC Radio’s “Bikini Chef” Susan Irby; Chef William Annesley of the History Channel’s “History on Tap;” Savannah Wise, star of “Ragtime” on Broadway; TV chefs Vinni Villicano and Nathan Lyon; actress Lisa Annitti; celebrity party planner Party Charlie; culinary recruiter Carrie “Lucky” McCully; actor Lance Spellerberg and Peggy Sweeney-McDonald. Sonoma Wine Garden’s three-course dinner will feature burrata panzanella, roasted cauliflower and romanoescao dressed with garlic vinaigrette, Sonoma salad, baby head lettuce, grapefruit and shaved parmesan. Second course: oven-roasted Sonoma chicken, organic Petaluma chicken with roasted root vegetables, grilled shrimp and grits, grilled white prawns with Anson Mills grits, bacon, kale and white cheddar. Third course: lemon bars. Over the past year, “Meanwhile, Back At Café Du Monde” (www.meanwhilebackatcafedumonde.com) has become a popular entertainment and food experience for audience from Louisiana to California receiving “thumbs up” and standing ovations. Now the show is coming to Southern California! “Meanwhile, Back At Café’ Du Monde” continues to gain momentum with new events booked at San Francisco’s famous Rrazz Room in the Hotel Nikko on Tuesday, March 8, the historic Musso & Frank Grill in Hollywood on Sunday, March 20 and at The Palace Grill in Santa Barbara on Monday, March 21. “We are proud to announce the launch of our new multi-media social integrated website (www.meanwhilebackatcafedumonde.com) which is available on one of the most popular food channels Livestream.com,” stated producer Peggy Sweeney-McDonald. The site features videos, press links, meet the cast, recipes and discussion on the hottest food trends. The site was designed and created by Crisher Entertainment in partnership with Google Sites. A portion of monologue show proceeds will be donated to STREETLIGHTS, a nonprofit job training, job placement and mentoring program that provides opportunities for employment in the entertainment industry for economically or socially disadvantaged young minority men and women. Tickets are available at $60 p/p which includes a three-course dinner, wine, show, tax and gratuity. For show and dinner reservations, please call 424-214-4560. 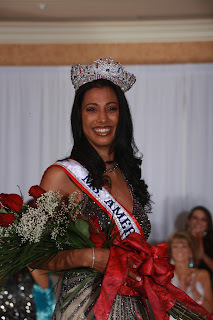 02.03.2011– Anaheim, CA – Tracy Broughton, 36, from Ladera Ranch, California rose above her own physical disability by being crowned Ms. America® at the national pageant January 30, 2011. She is also adding positive history to Black History Month because she is the first African American to be crowned Ms. America®. “I was able to overcome my disability through a combination of therapy, faith and perseverance,” says Tracy. Tracy Broughton grew up in Orange County, California and battled adversity practically her whole life. At three years of age, she was kidnapped; a car thief took her parent’s car while she was still asleep inside. She was a scholar athlete at Irvine High School, playing varsity tennis, cheer, dance, soccer, and a host of other sports. In high school, Broughton was in a car accident that left her paralyzed on the left side. Doctors told her mother she would never walk again. She proved the doctors wrong by walking. Two months after graduating high school, her mother passed away, Broughton went on to pursue a modeling career where she traveled internationally, gracing the covers of calendars, featured in magazines and catalogs and has appeared in TV shows, music videos and commercials. In 1996, Broughton was in another car accident while driving home from a modeling job. The left side of her body was paralyzed, and once again doctors told her she would never walk. For more than a decade, she underwent various therapies until finally she stood up with two crutches and now she uses only one. Broughton didn’t let her disability slow her down. While in a wheelchair, she won the 2003 Ms. Black California pageant. “I did all the dances and runway in my wheelchair,” she said. A single mom to 11 year old identical twin sons, Broughton also volunteers with many nonprofit organizations. As Ms. America® 2011, Broughton is honored to represent an organization that enriches the lives of women across the country and is passionate about continuing to give back to others through philanthropic endeavors and being the inspiration that helps others achieve their dreams. The Ms. America® Pageant is for women 26 years of age and up who are single, divorced, married, widowed or a single parent. The pageant is based on four areas of competition: Evening Gown, Interview, Sportswear and Finalist On-Stage Question. The Ms. America Pageant® is a registered federal trademark with the USPTO office in Washington DCsince February 2000.